Literally, Nakuru means Dusty Place. Welcome to “dusty place”! This park was first gazetted as a bird sanctuary in 1960 and upgraded to National Park status in June 1968 purposely to protect the huge flocks of the lesser flamingoes that inhabit the site. A northern extension to the park was added in 1974. Over 1 million flamingoes in the park turn the shores of Lake Nakuru into a floating pink carpet. Lake Nakuru National Park is located app. 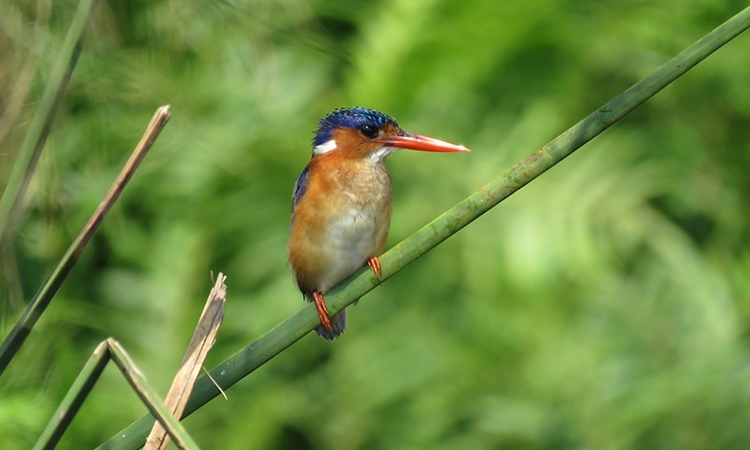 157 kilometers from Nairobi on an ecologically diverse area which comprises of a very shallow, strongly alkaline lake, with surrounding woodland and grassland set in a picturesque landscape. The lake catchment is bounded by Menengai Crater to the north, the Bahati Hills to the north-east and the Lion Hill ranges to the east, Eburu Crater to the south and the Mau Escarpment to the west. Three major rivers, the Njoro, Makalia, and Enderit, drain into the lake, together with treated water from the town’s sewage works and the outflow from several springs along the shore. The foundation of the lake’s simple food chains is the cyanophyte Spirulina platensis, which often occurs as a unialgal bloom. At such times it supports huge numbers of Lesser Flamingos and Kenya’s endemic fish- Graham’sCichlid which was introduced in 1960 from Lake Magadi to curb mosquitoes. The fish, in turn, support a number of secondary consumers. The lakeshores are mainly open alkaline mud, with areas of sedge Cyperus laevigatus and Typha marsh around the river inflows and springs, giving way to grassland and a belt of Acacia xanthophloea woodland. Rocky hillsides on the park’s eastern perimeter are covered with Tarchonanthus scrub and magnificent Euphorbia forest. Lake Nakuru National Park (Ramsar Site) boost up to 450 species bird checklist, a record of 1,496,000 waterbirds record. Five globally threatened species have been recorded here, namely Madagascar Pond-Heron, Lesser Flamingo, Pallid Harrier, Greater Spotted Eagle, Grey-crested Helmet-shrike along with large congregations of Greater Flamingo, Black-necked Grebe, Little Grebe, Great White Pelican, Yellow-billed Stork, African Spoonbill, Black-winged Stilt, Grey-headed Gull and Gull-billed Tern. The lake is internationally famous for its healthy populations of the globally threatened Lesser Flamingo, numbers can reach 1.5 million at times, though drastic and unpredictable fluctuations occur. Undoubtedly Nakuru is a very important feeding site for this species; attempts by flamingos to breed here have not been successful. Other waterfowl have increased considerably in numbers and diversity since the introduction of fish in 1961. At times Nakuru is a major feeding ground for the Great White Pelican, which nests on rocky islets in nearby Lake Elmenteita and moves to Nakuru daily to feed. Large numbers of Palearctic waders winter at Nakuru or use the site on passage, and Nakuru has been a key site in the eastern Rift Valley flyway. The park is a sanctuary for the Black Rhino and White Rhino, the latter introduced from South Africa. Rothschild’s Giraffe was also introduced into the park in 1977. The rare Ethiopian Large-eared Roundleaf Batis resident. Other large mammals, some recently reintroduced, include African Lion, Cape Buffalo, Leopard, Black-and-white Colobus Monkey in the forest, the Common Eland, Steinbok, Impala, Chandler’s Reedbuck, Dikdik in the bush-land along with the Rock hyrax and the Klipspringer on the cliffs and escarpment.